Plant description: Biennial, or short-lived perennial, native to temperate Europe, naturalized in North America and other temperate regions. Develops a large basal rosette of hairy leaves in the first year, and a 1-2 m tall, flower-bearing stem by the second year. The downwards pointing flowers form a large dense terminal cluster at the sun-exposed side of the stem. Their color is usually a bright purple, but can also be pink, red, white or yellow. The flowers are bell or thimble shaped, heavily spotted on the inside and possess large, interlocking hairs that prevent smaller insects from entering the flower. Only larger insects like bumblebees are able to climb into the flower head and collect nectar, whereby flower pollen sticks to their back and legs. The main pollinators for foxgloves are bumblebees, which are attracted especially to the color purple. The flowers open only when they are ripe for pollination. They are bell-shaped and have a ‘lip’, which provides a perfect landing platform for bumblebees. The entrance of the flower is covered with guard hairs, which prevent smaller insects from entering. To bumblebees however they provide an additional grip when landing. First to open are the flowers at lower parts of the stem, which are initially male and later turn female. This ensures cross-fertilization. Foxglove flowers from May through June and until late September. The extended flowering period ensures pollination even if weather conditions may not be favorable for pollinators all the time. Additional smaller flowering stems may arise, when the main stem has flowered ready. Each pollinated flower produces a seed pod which turns brown and bursts open, releasing hundreds of small, light brown seeds. Folklore: The scientific name digitalis is derived from Latin digitus, meaning “finger”, in reference to the shape of the flowers, which are resemble thimbles. The flowers have inspired human imagination for centuries. Fairies were though of as using them as a headdress or to have given them to foxes as gloves. Foxes could then break soundlessly into houses and steal the fowl. Foxes were also believed to use the flowers as warning bells, signalling to each other when hunters were approaching. The spotted patterns on the flowers were thought to be the finger prints of evil fairies. 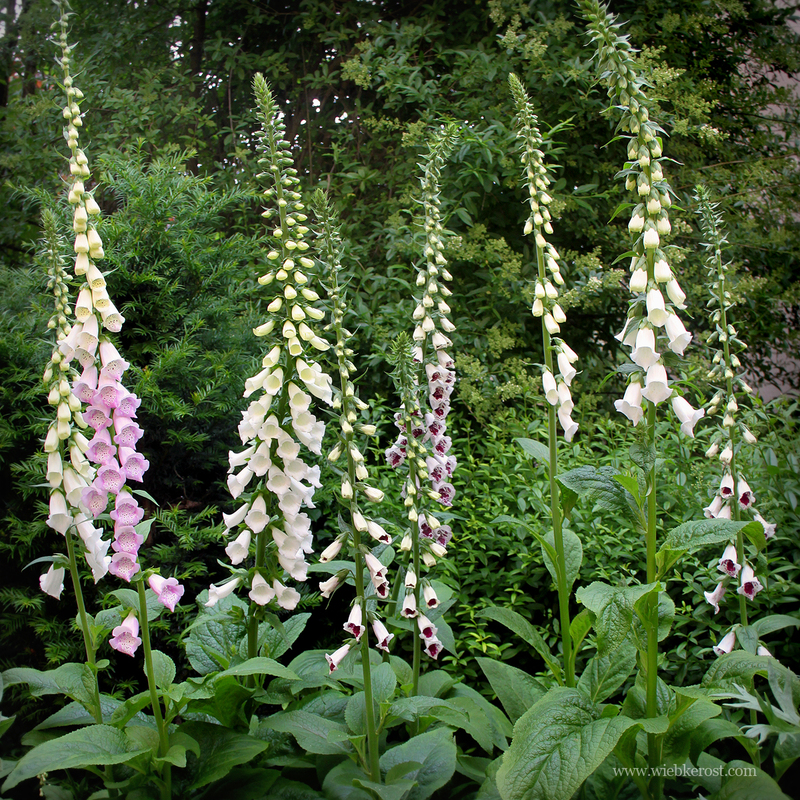 In Ireland foxglove was believed to avert the evil eye and the leaves to help break hexes. In Roman mythology, Flora showed Hera or Juno how to impregnate herself without the need of a man, by touching her belly and her breasts with foxglove. She thereupon either gave birth to Mars or Vulcan. Dew collected from the flowers and leaves is used in ritual for communion with the fairy folks. Medical history: Strangely, the plant did not received much attention in the medical literature of the middle ages and antiquity. The British used it as an emetic and against tuberculosis until testings on turkeys showed a reduced size of heart, lung and liver in the animals. In 1775 the British physician William Withering began researching the effects of digitalis on the cardiac system, after a herb women had drawn his attention towards the plant, and in 1785 released the famous treatise “An account of the Foxglove and its medical uses”. The french physician Drebeyne continued to research the effects of digitalis on the heart. In 1868 the chemist Nativelle isolated the active substance from the plant. During the following years other plants were found to contain similar, heart effecting substances, which were subsequently named digitalis glycosides, e.g. Convallaria majalis, Nerium oleander and Helleborus niger. (The only plant that had until then been known to have such effects in humans was Drimia maritima.) Today the main source for digitalis glycosides is Digitalis lanata, the Woolly Foxglove. 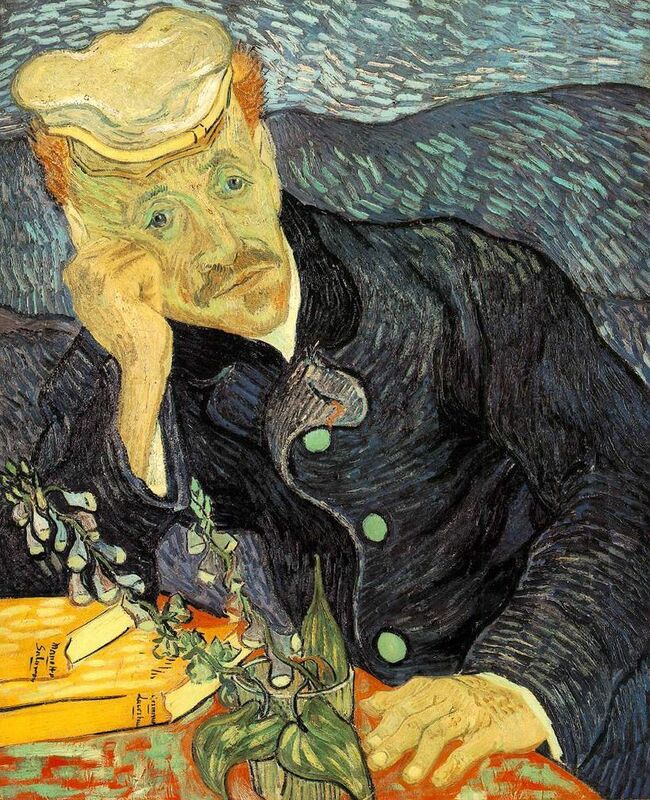 The dutch painter Vincent van Gogh is said to have had his epilepsy treated with Digitalis (Digoxin). He also portrayed his friend and doctor in charge with a foxglove flower. Medicinal uses and toxicity: Foxglove contains the cardiac glycosides Digoxin and Digitoxin, which are cardio tonics. At the right dose they cause the heart muscle to carry out stronger contractions, thus having a positive, strengthening effect on the heart and lowering the heart rate. They also act diuretic, increasing urine flow. However, the interval from a non-effective to an over-dose is very small. Over-dose will cause a lowered pulse rate, nausea, vomiting, uncoordinated contractions of different parts of the heart and ultimately leading to cardiac arrest and death. 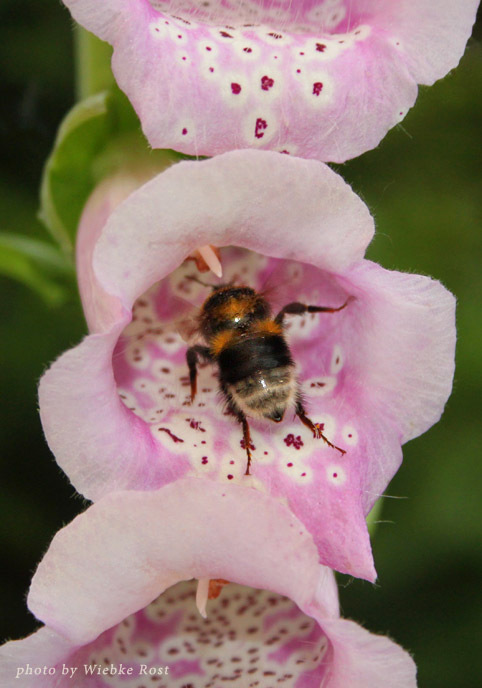 Most poisonings with digitalis are caused by medical error. Poisoning through ingestion occurs rather seldom, since the leaves have an acrid bitter taste. It would be treated with emetics and the stomach-pump. Antidotes are Atropine and nitrites. Today digitalis glycosides are mostly applied for lowering the heart rate. New research conducted by Norwegian scientists points to possible anti-carcinogenic properties. Another compound found exclusively in the flowers and leaves of D. purpurea, D. orientalis and D. lanata is the steroid Digoxigenin (DIG), which has a wide range of applications as an immuno-histochemical marker. Digitalis is a historic anti-dote in aconite poisoning. Propagation by seed: The seeds need light and moderate temperatures to germinate. Sow directly into the bed or cultivate in seeds trays and plant out when the seedlings have developed the first rosette of leaves. Grows on cut-over land, at forest way sides and forest glades. Prefers fresh, loose, lime-deficient and humus-rich soil. The ground should be moist but well-drained and can be slightly acidic. Cut flower stems before they produce seed to avoid self-propagation. Therefore may sprout anew and flower again the following year. Mulching will also prevent reseeding. Shop note: I have seeds for the classic Digitalis purpurea, as well as the variants “Alba” (large white flowers) and “Pam’s Choice” (white flowers with dark red spots). Small amounts of dried foxglove leaf and flowers are also available.